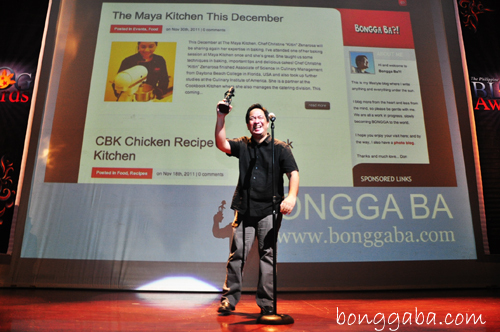 Bonggaba.com Grabs 2011 Best Lifestyle Blog Luzon Category - Bongga Ba?! Until now, I’m still speechless. I was not expecting this! I was unprepared. Promise. The fact that it was the first category awarded that night didn’t help. And the winner is … Bongga Ba! I then proceeded to the stage to get the award. It was unexpected. I had no clue and no acceptance speech prepared! Just a plain “Thank you” was all I got to say because I was really surprised. It was my first time to accept an award and was too shy and nervous to talk in front of a huge audience. I was literally speechless during the awards night so I’ll say my acceptance speech here instead. I don’t consider blogging as work because I love what I share in Bongga Ba. The only time I consider it as work is whenever I need to tweak its technical side. All I know is how to fix computers, cook, eat, and all sorts of other things. In fact, I’m not even into writing! Hehe! It really took time for me to understand the ins and outs of blogging. But all I can say is, patience is indeed a virtue. That day was my BEST DAY EVER! Aside from my new kitchen showcase that I bought for less as the Focus Global warehouse sale in Pioneer, Pasig City, I also won a Nokia 101 dual sim phone from Nokia, and an iPad2 from TV5! But these are just things, things that I need. 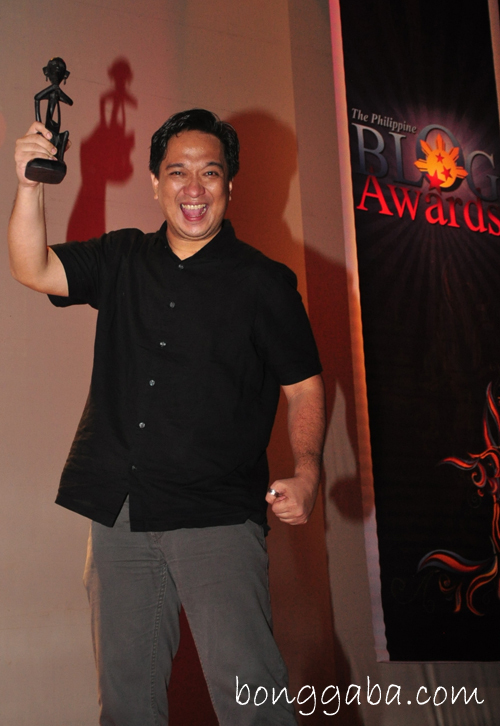 The most precious gift that I received was grabbing the title of Best Lifestyle Blog in Luzon for 2011 at the Philippine Blog Awards that was held at Carlos P. Romulo Theater, RCBC Plaza in Makati City. The awards night was a great ending to a very lucky day. congrats! you deserve it sir. Bongga, tito don! 🙂 Blogged about this too! ♥ Congratulations again to you and tito fitz!!!! Cheers to more bongga posts!